Discussion in 'Amps and Cabs' started by daveS, Apr 23, 2008. 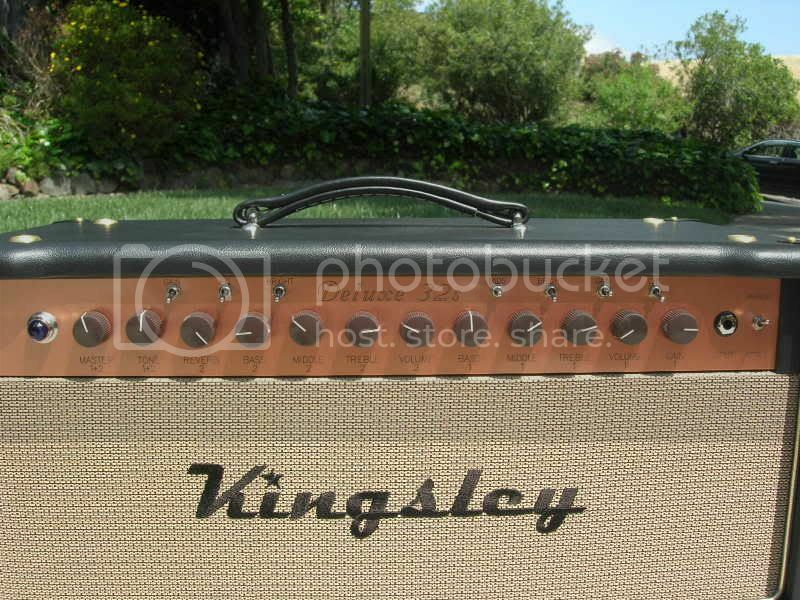 I've got a new Kingsley on the way from Simon....its a D32S. D32S is basically the EL84 equipped D32, with the addition of channel switching...hence the "S" for switching. The series/parallel function is taken from the Tonebaron. The cool thing about this feature is that you can run, for instance, a delay through this loop (in & out jacks) when you use the series mode as a sort of quasi-FX loop. Also, since the reverb is only on the Clean channel, you can color the OD channel with some reverb by running the amp in series. Parallel with treat the amp channels like a normal switcher amp. I also opted for 3 footpedals just to maximize flexibility. The nice thing is, if for instance there is no need for use of the "boost" functions, or no need to footswitch the EQ lift on/off, I can just unplug the pedals. - The first one is the clean channel. -The 3rd one is the OD channel with gain position 3. Simon tells me that the amp has much more gain on tap if I need it. 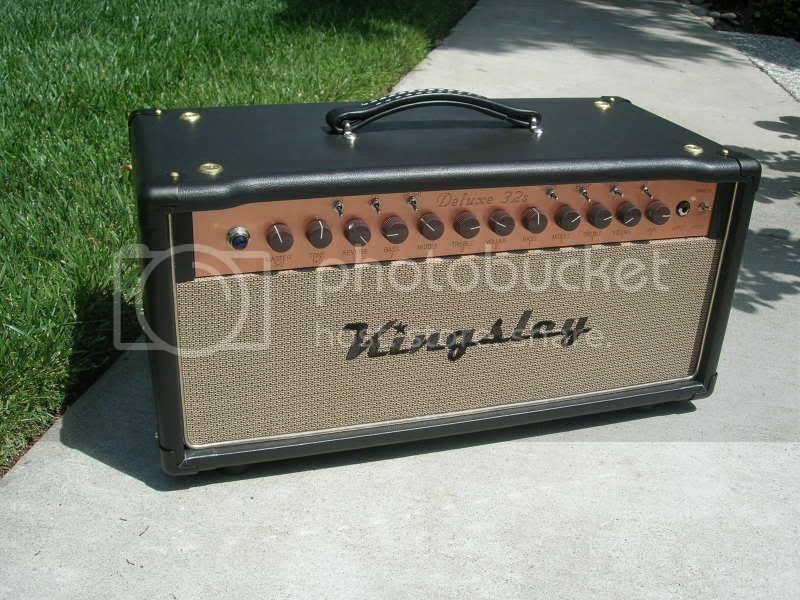 This is the third Kingsley I have owned. I started with a Deluxe 1+2 combo and loved it but needed more power. 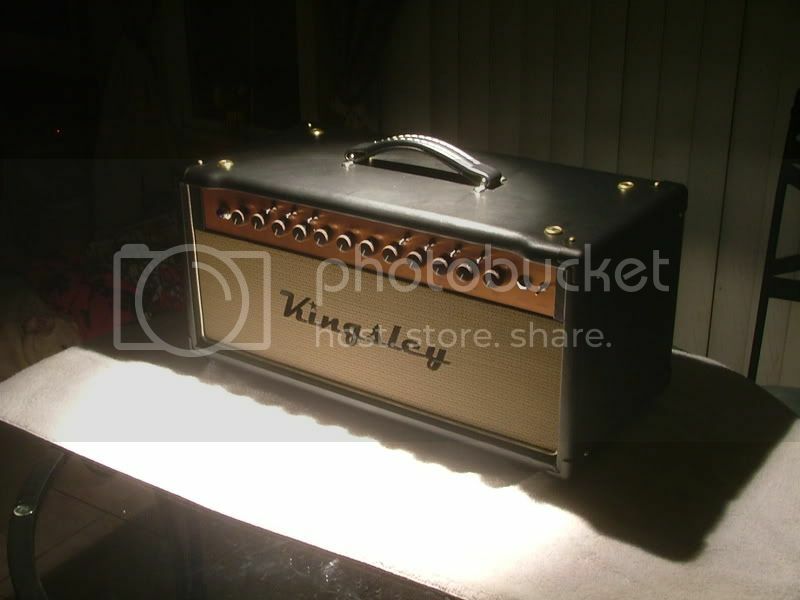 Then, I got a D30C 1X12 combo and loved that amp too...but I decided I wanted channel switching. So, I ordered this from Simon with my "dream list" of options. 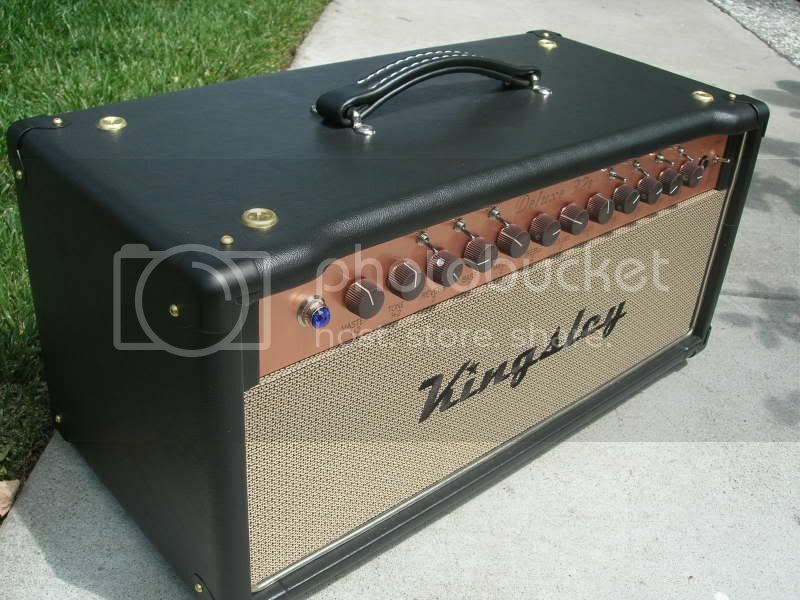 I'm totally stoked to be getting this amp. Simon Jarrett is awesome to work with...he makes such a killer amp and has great patience. He incorporated everything I asked for. Thanks to Simon for his efforts in creating this amp ! It will probably ship out to me tomorrow....obviously more feedback to come after I get some time with it. That sounds great, and Simon can really play. That third clip sounds like a big ole 335, strat you say? Guess the amp is just that good. Kingsley has always ranked WAY up at the top in my book. Maybe one day I will be fortunate enough to own one. I'm shipping Simon a pallet load of No Dose. The last time I saw your amp, about 2 weeks ago at Simon's, it was in a temporary head shell...and now it looks all dressed up formally! Very nice. And yes, with the boost on, which you did not hear on mine, the gain kicks up a notch and it actually plentiful...and this little amp is capable of quite a range of rage from chimey cleans to beyond classic rock. You're a lucky man! I know! Ha! I can do dat! Lol...thanks for the heads up!! Congrats on the amp. Killer sounds. Definitely my next big purchase. I'll be very interested in your opinions once it arrives. What speakers are you planning on playing it through? Yeah I'm really fired up about this amp. 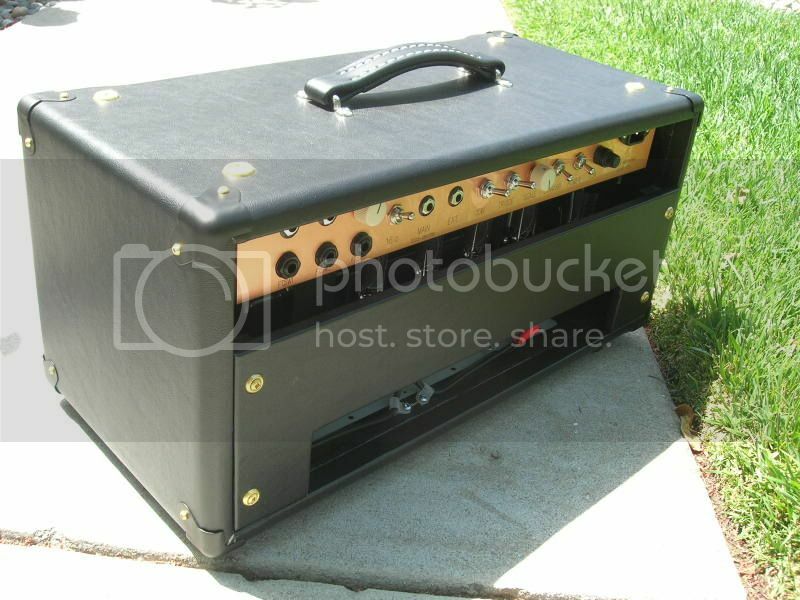 4) A Bob Burt 2x12 "V" pine cab with an oval ported back and some "Wherehouse Speaker" Celestion copies in it. I have a Celestion Gold that I might put in there and maybe hunt down a Celestion G12 or another Scummie. So, the short answer is: I'm not sure what cab & speakers I'm going to go with yet...going to play around with it and let it talk to me. I'm mainly a strat player and like to go from clean w/reverb, to edgy SRVish, to high gain ala Lynch/EVH (I have a hotrails at the bridge ). Not sure which speaker combos with work the best here but I know the D32S will be able to deliver on all fronts. Got the amp last night...yeah ! I haven't had much time on it yet, I'm going to tear into it this weekend It's ok because I'm waiting for 3 stereo cables to arrive so I can use the footswitches. So far, it sounds amazing through the 1X2 Bob Burt cab with a Scumback H75. Goes from clean to crunch with the flick of a switch ! Simon even sends you clips of your very own amp! How cool is that? Man, that thing sounds sweet. congrats on the new amp!!!! I have and love a Deluxe32C with powerscaling and the cool EL84/6v6 mixture of tubes (with separate knobs for each tube type)...amazing range of tones in that amp and I haven't even done much with the boost pedal yet and all those possible combinations that will create. Your amp has an incredible array of tonal options and clearly Simon is continuing to widen the possibilities of this already really versatile amp! I have been particularly impressed with the gainier sounds in the amp, esp with the eq lift switch...the cleans are great as well but the gainier channel with a ES-335 is a really great combo! Enjoy the amp! don't see how you couldn't!! Eric, sounds like we have similar models. If you haven't already, you really should try some EL34s, 6L6s, 5881s instead of 6V6s. I love all the flavors. 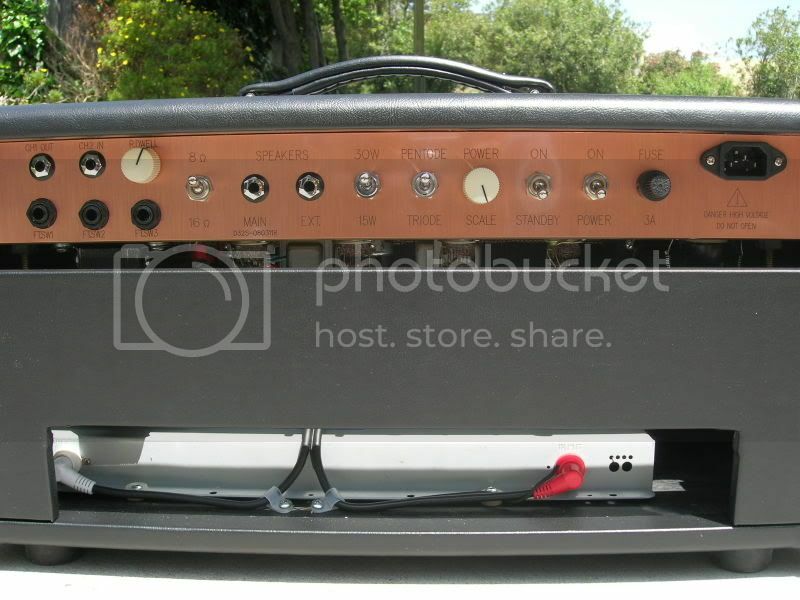 Man that's a beautiful amp. Enjoy!